Ota suffers from bipolar disorder and is in need of her medication. In Los Angeles, police and loved ones are asking for the public's help in the search for a woman who has been missing since last week. Carol Ota was last seen in the Westchester area on the morning of November 7. According to the Los Angeles Police Department Missing Person's Unit, Ota was last seen in the 12000 block of Juniette Street around 7:00am last Friday. She suffers from bipolar disorder and is in need of her medication. 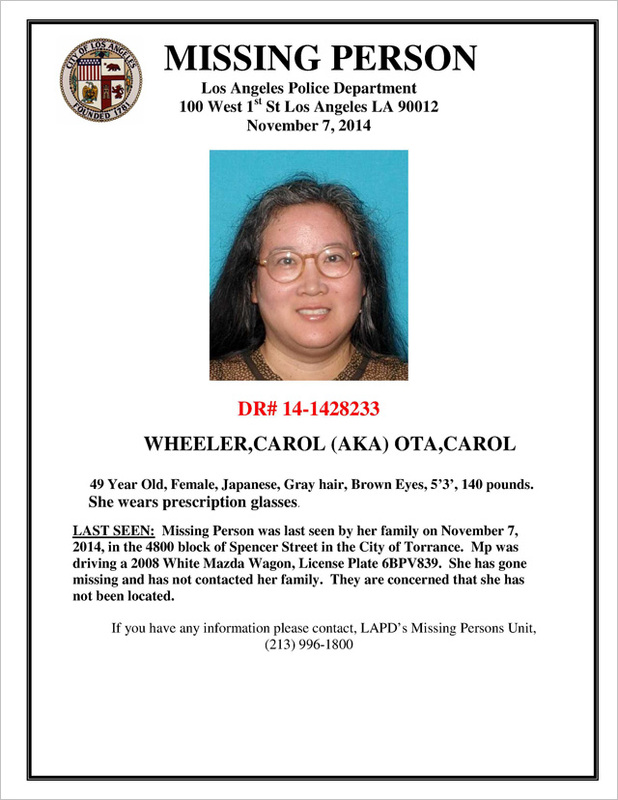 Carol is described as a 49-year-old Japanese female with grey hair and brown eyes. She stands 5 feet 3 inches tall, weighs about 140 pounds, and wears prescription glasses. She was driving a 2008 White Mazda Wagon with the license plate 6BPV839. Anyone with information on her whereabouts is urged to contact Missing Person's Unit Detective A. Mercado at (213) 996-1800 or (877)527-3247. During non- business hours or on weekends, calls should be directed to 1-877-LAPD-24-7 (877-527-3247). Anyone wishing to remain anonymous should call Crime Stoppers at 800-222-8477. Tipsters may also contact Crime Stoppers by texting to phone number 274637 with a cell phone. All text messages should begin with the letters "LAPD." Tipsters may also go to LAPDOnline.org, click on "webtips" and follow the prompts.